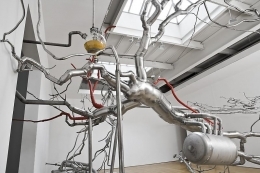 For Roxy Paine’s fourth solo exhibition at James Cohan Gallery, opening October 16 and running through December 11, 2010, the gallery is proud to present the artist’s new large-scale installation Distillation (2010). A single continuous piece, the artwork begins at the gallery’s front door and pierces its walls to travel all the way through the space to the back offices. The sculpture is Paine’s newest addition to his stainless steel Dendroid series, which includes Maelstrom, featured on the Metropolitan Museum of Art’s Roof Garden in 2009. 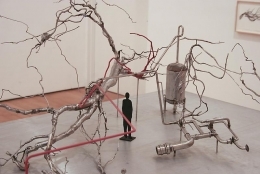 Roxy Paine’s monumental new work Distillation becomes a metaphor for the artist's mental process. Paine re-examines alchemical methods to create a meditation on mystical industrialism. 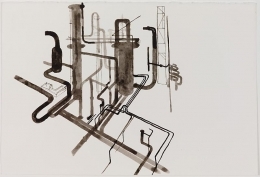 If the process of distillation is an attempt to find purity, the sculpture Distillation demonstrates the impossibility of that goal. An apt analogy can be found in Hilary Mantel’s writing on the alchemic practice in her 1989 novel Fludd, “After separation, drying out, moistening, dissolving, coagulating, fermenting, comes purification, recombination: the creation of substances the world until now has never beheld.” Paine describes his process as the fermentation of bundles of information, then the extraction of discrete compounds from the resultant mash, which when fractionated, overlaid and recombined become a transmutation from the familiar to the entirely new. 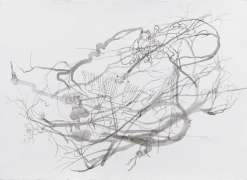 Paine's extensive body of work explores collisions between the natural world and the industrial. 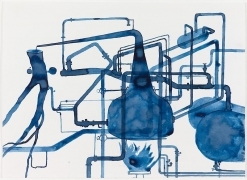 Distillation is an amalgam of structures that refer to vascular, neural, taxonomic, arboreal, mycological and industrial systems. 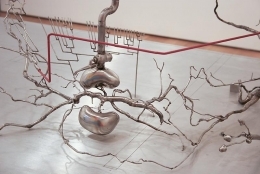 The sculpture includes elements such as valves and flanges from petro chemical plants, tanks used for food processing, and glass vessels from the pharmaceutical industry. 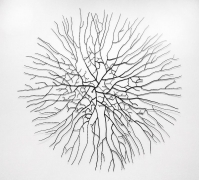 These seemingly standardized elements coexist with constructed parts such as blood vessels, neurons, hallucinogenic fungus, mycelium, bacterial formations, tree branches, a pair of kidneys, and a black box—all of these elements have varying levels of finish, from polished to raw steel to the introduction of paint. 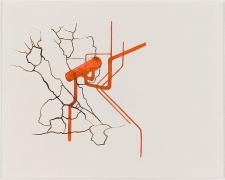 On view in Gallery One, is a new wall installation from Paine’s Replicant series. 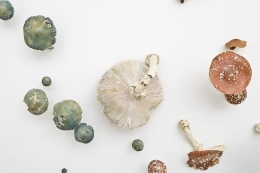 In this series the artist creates meticulous simulacra of botanical species and eukaryotic organisms. 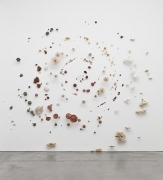 Paine chooses to depict undesirable and toxic classes of plants or fungus; in the case of this installation 25 different fungus species from the psychoactive to the poisonous compete for space directly on the wall. 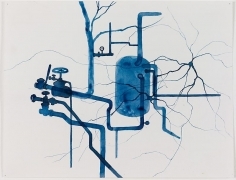 Works from Paine’s Dendroid series are included in many important public collections including Split (2003), Seattle Art Museum; Placebo (2004), St Louis Art Museum; Conjoined (2007), Modern Art Museum of Fort Worth; Askew (2009), North Carolina Museum of Art; Graft (2009), National Gallery Sculpture Garden, Washington, DC; Billboard/Façade (2009/2010), WANAS Foundation, Knislinge, Sweden. 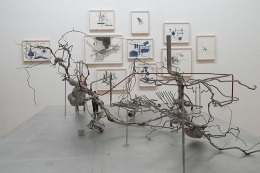 Paine’s exhibitions international public commissions to be installed over the next six months include Inversion (2008), The Israel Museum; 100 Foot Line (2010), The National Gallery of Canada; Ferment (2010), Nelson Atkins Museum of Art, Kansas City, MO; Yield (2010), Crystal Bridges, Bentonville, AK; and Discrepancy (2011) commissioned by the insurance company Munich Re to be installed in Munich, Germany. For further information, please contact Jane Cohan or Peter Brandt. To view a video portrait the artist, view works and read press articles, please visit the artist’s page on the website please visit James Cohan Gallery .